The 2014 New York Giants season was the franchise's 90th season in the National Football League, the fifth playing their home games at MetLife Stadium and the eleventh under head coach Tom Coughlin. The team failed to improve on their 7–9 mark from 2013, finishing 6–10. To commemorate their ninetieth anniversary, the Giants wore a special patch on their jerseys. 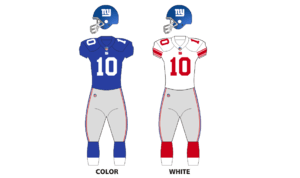 In addition, the team wore white pants instead of gray for two home games versus the Indianapolis Colts in Week 9 on Monday Night Football and two weeks later against the San Francisco 49ers. With their loss to the Jaguars on November 30, 2014, the Giants sealed their second consecutive losing season. The Giants traded their seventh-round selection (No. 225 overall) to the Carolina Panthers in exchange for linebacker Jon Beason. The Lions routed the Giants 35-14. With the loss, the Giants opened the season with an 0-1 record. This would be the Giants largest margin of victory since their 42-7 win over the Eagles in 2012. Rookie Odell Beckham Jr. would record his 1st NFL touchdown in this game. The Giants were dominated from start to finish as the Eagles routed them 27-0. It was only the second time this season that an NFL team failed to score in a game (the Jets were shut out 31-0 in Week 5 against the Chargers). The loss snapped the Giants' 3 game winning streak as their overall record fell to 3-3. This was the first Sunday Night Football game held in MetLife Stadium following a one-season absence. With the loss, the Giants fell to 3-8, and were mathematically eliminated from playoff contention after the Lions defeated the Bears on Thanksgiving four days later. In this game, Odell Beckham Jr. broke Giants' franchise records for most receptions by a rookie and most receiving yards by a rookie, previously set by Jeremy Shockey in 2002. Beckham also topped 1,000 yards receiving for the season. In both cases, it should be noted that this was achieved despite Beckham missing the first four games of the season. With the loss, the Giants finished the season 6-10 and were swept by the Eagles for the first time since 2010. Also, their record against the Eagles fell to 3-11 dating back to 2008. ↑ Salomone, Dan. "Which games will Giants wear white pants?". www.giants.com. Retrieved 4 July 2014.